Some more exciting vegetarian products have graced our table this month and so here is a round-up of the products we received and what we thought of them. Having sampled Cawston Press Juice recently, I was excited to receive some new offerings from Cawston Press' lightly sparkling drinks range. A "grown-up" take on the humble soft drink, these new flavours are fantastic drunk just as they are, or mixed with your favourite choice of tipple. Each canned drink is made from a blend of pressed fruit juices mixed with sparkling water and without any colourings, preservatives or artificial sweeteners. 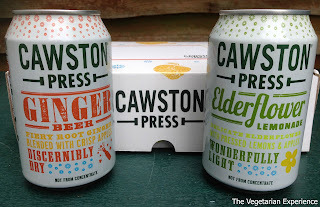 I was sent some of the new flavours in the range include Ginger Beer and Elderflower Lemonade. Ginger Beer - a dry twist on the classic, with fiery root ginger and pressed apple juice. I tried both products and was impressed with the intense flavours. Having said that, both flavours were so light and smooth and went down really well in a glass with some ice. It seems that they are the perfect beverage for summer, especially to pack in a picnic basket!! The Elderflower Lemonade stood out to me as a clear winner. I could imagine sitting drinking this on a warm summer day and a cool summer evening. Look out for them on the shelves of Waitrose, Ocado and other supermarkets. Our Little Secret is a unique brand inspired by world flavours including Indian, Oriental and Mediterranean dishes. The brand aims to bring expertly prepared cuisine to the table in a convenient and easy way. Having scoured the globe for the tastiest ingredients, the Our Little Secret range includes nineteen individual products that are divided into meal kits, authentic cook-in sauces and single portion pots of rice. 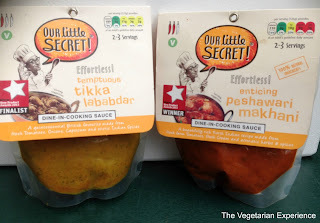 We were sent an Our Little Secret Makhani sauce and a Tikka Lababdar sauce. We love Indian food in our family so we were excited to try them out. I am also constantly short of time during the week and so this sauce was a great "quick fix" for me to get meals prepared. I prepared the tikka sauce with some quorn chicken style pieces, and served it with some rice. 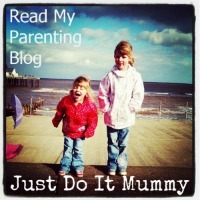 It went down a treat and the kids enjoyed the smooth flavour that the tikka had. I served the peshwari sauce with some vegetables and served it with naan bread for hubby and I one evening. We both also enjoyed the sauce and would definitely look out for it in the supermarket. Our Little Secret Sauces are available to buy in Morrisons Supermarkets and Makro Cash and Carry stores. An approach to ask me to review any kind of chocolate is rarely turned down, especially when the chocolate in question is suitable for vegetarians and surprisingly also vegans - a rare find in the market these days. Enter Beech’s Fine Chocolates, who have been producing quality traditional British Chocolates in Preston, Lancashire since 1920. All of Beech’s products are made using the finest ingredients and only natural colours and flavours. 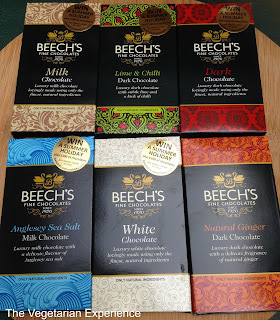 I was sent a whole host of different flavours including Beech's Milk Chocolate, White Chocolate and Anglesey Sea Salt Milk Chocolate flavours which are all suitable for vegetarians. I also received Dark Chocolate, Lime and Chilli Dark Chocolate, and Ginger Dark Chocolate which are all suitable for vegans. When the chocolate bars arrived, I loved the look of the packaging. The chocolate looks a little extra special and I could imagine bringing it out and serving to friends. Having sampled all of the flavours, I can honestly say that all of them were delicious. However, there were some clear winners which stood out, including the more interesting flavour combinations of Anglesey Sea Salt, the Ginger, and the Chilli and Lime dark chocolate, which we all agreed was really delicious and our clear favourite. Beech's Fine Chocolate is perfect to enjoy as it is, but you can also cook with it. The thins are great for popping on top of cakes or cupcakes, the dark bar can be grated and used in sweet or even savoury cooking. Beech's Fine Chocolates are available to buy online on their website.